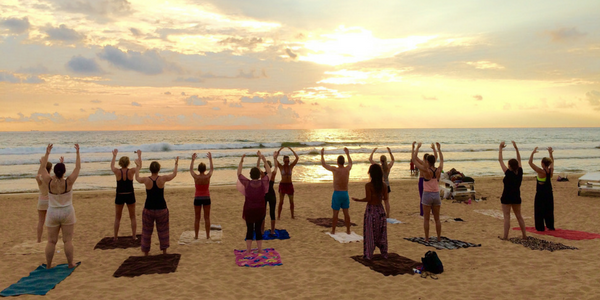 The number of yoga holidays available are on the rise and yogis are becoming more adventurous. From teaching yoga on many AdventureYogi holidays and my own I have noticed that people who practice yoga with me become more alive and their sense for adventure increases as they search for a more fulfilled life. When our lives are peaceful and rich with healthy and fun filled activities (food for the soul) we increase our general health (body and mind) and we are able to ride the storms of our lives more easily. After teaching adventures and active yoga holidays for several years now one of my favourites is the yoga and diving holiday. Yoga is an ancient practice that invites us to unite body and mind through the breath. The breath is the bridge that allows us to come into a state of union with ourselves bringing about a feeling of calm and general wellbeing. It is not surprising that millions of people of all ages all over the world have found a sanctum on the yoga mat enhancing their lives. Long time study has now proven the physical, mental and emotional benefits and the practice of yoga is becoming even more popular. I have found that the combination of Yoga (postures), Pranayama (breath control), meditation and scuba diving/free diving becomes a personal journey of bringing the diving onto the mat and the yoga into the sea having a transformative affect in our practice and diving. Something magical happens when we swap the backdrop of our yoga studio with palm trees, white sands and a clear blue sea. Already we begin to feel the benefits which will only become more and more enhanced through your experience on your mat and in the deep blue. Practicing yoga by the waters edge gives us a deeper connection to the sea, but also the liberating qualities of water within us. We are made of 75% water (or more depending on age) just like the planet. Once we begin to understand that our bodies are fluid we begin to let go of tension and dryness in our muscles and mind, being able to dive into our own inner ocean and explore what treasures are hidden there. Sometimes fierce and passionate and other times calm and still. By tuning into the element of water we also connect with our emotions allowing us to enter into a state of presence and wisdom which transforms our everyday life. Emotion literally means movements of energy i.e. a movement of feelings/ an active movement of consciousness. When listening to the feeling body, our inner ocean, we are able to balance them through our yoga asanas (posture), pranayama (breath control) and stilling the mind in meditation. Why practice yoga on a diving holiday? For our yoga and diving adventures I create a bespoke yoga programme that will enhance your understanding of your own fluid body, finding your own inner current, a state of neutral buoyancy of mind which leads to a meditative state of being. 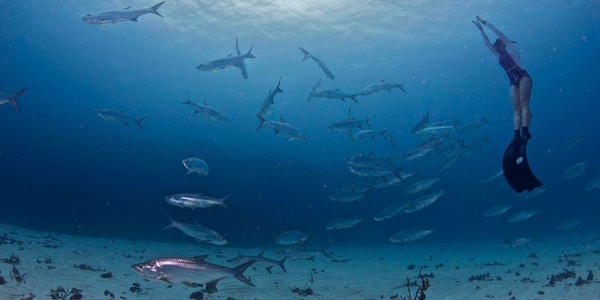 Many yoga and diving enthusiasts have told me they feel more comfortable in the sea after yoga, as if they become one with it…they see through the eyes of the heart and everything takes a whole new form. The dive becomes like a meditation, they surrender and become one with the natural ebb and flow of their breath, surrendering to the oceans current. The body is also stronger and more flexible which is important in diving. After speaking to many divers and free divers I have become aware that over breathing, or breathing too quickly in diving is very common. This can lead to hyperventilation increasing CO2 in the blood and can cause problems. When there is a lack of oxygen in the blood it affects our nervous system and our ability to think clearly, which is something we can’t afford to happen when we are diving. A clear calm focused mind is essential to have a safe and enjoyable dive, after all that’s what it’s all about. This of course is also reflective to our life in general. Some people find that they naturally hold their breath when they learn to dive as our body ‘knows’ that it’s not meant breathe under water. 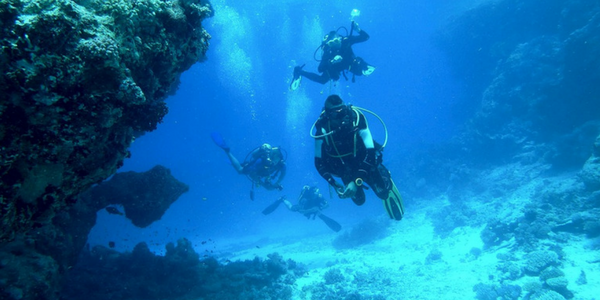 When you learn to scuba dive we learn that we must never hold our breath when we dive. When learning to dive we have to ‘teach’ the body it can breathe underwater with the use of the scuba cylinder, and with yogic breath control we adjust to the underwater breath, immediately entering a more relaxed state of being. Through the Yoga practice we become aware of the breath (new divers or the more advanced) emphasising on proper inhalations and exhalations, especially important for beginners. With the positive affects of the many fundamental breathing exercises in yoga, scuba divers and free divers have found that their yoga gives them a deeper affinity with themselves and the sea. The practice of the yogic breath can improve your air consumption, offering a more pleasurable and longer dive, and the physical yoga postures relieve tensions in the body from heavy tanks and weight belts. When our bodies are more relaxed and our breathing balanced, the dive becomes more enjoyable and you are left with an even more positive diving experience. Yoga and diving holidays have taken me to many different countries and oceans meeting the most fabulous yogis and divers from all over the world and with much passion continuing to do so. Whether you want to explore the tranquil desert of Egypt and the beautiful Red Sea, Tobago and the Caribbean Ocean, Sri Lanka and the Indian Ocean…or perhaps Bali and its surrounding oceans your experience will be many folds leaving you feeling utterly fabulous.